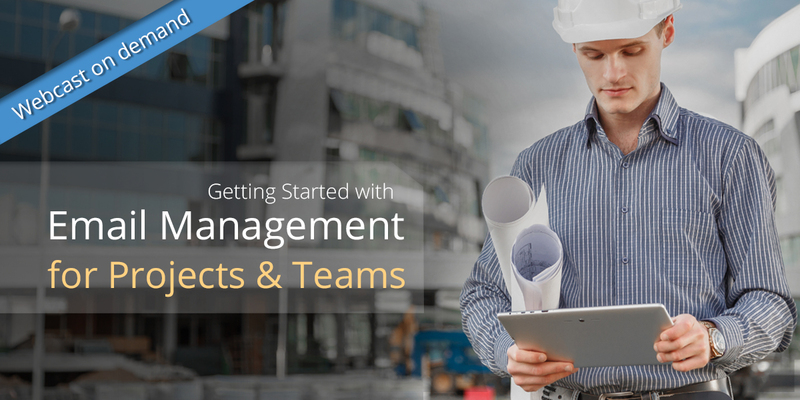 Did you miss our webcast, “Getting Started with Email Management for Project and Teams”? On August 1st, the SKYSITE team provided insights into one of our recent additions: Email Management. This new feature addresses the countless times you’ve found yourself spending time searching for an email with important project details. Perhaps something regarding the budget or a timeline. For better or worse, email is the way most of us send information. The problem is easily finding it when you need it. Why do you need email management? Consider the time spent reading and answering emails. According to a 2017 study done by Carleton University, while in the office, workers spend one-third of their time reading and answering emails. When working from home, that time increases to 50 percent. And, of those emails, 30 percent are neither urgent nor important. That’s why SKYSITE added Email Management to its feature portfolio. Now, you can store, track, sync and search your team’s project email in one place, along with all the other project documents you need and use. Working on a project demands a lot of communication and collaboration. With so many parties involved and different designers working on different pieces of a project, it can make keeping everyone in sync a challenge. In the On-Demand webcast, which includes a demo, you’ll learn how email management creates a single source of truth for your projects, keeps project communications and information safe and secure, and provides mobile access even when you’re out in the field.